Intake for our course will commence at the start of September. We do not have a January intake. PLEASE READ THE INFORMATION ON THE UCAS LINK ABOVE CAREFULLY BEFORE APPLYING. The School Direct (Salaried) Programme is an employment-based route to becoming a qualified teacher and achieving Qualified Teacher Status (QTS). The training, which normally takes three terms, takes account of previous experience and is tailored to suit individual needs. The National College for Teaching and Leadership (NCTL) pays a subsidy towards a trainee’s salary, training and resources. Although it is possible to train as a primary or secondary teacher via this route, our consortium only trains primary teachers, who may choose to focus on Foundation and KS1 or KS1 and KS2. Throughout this experience trainees acquire the skills, knowledge and understanding of the range of elements which make an outstanding teacher, as specified in the Teachers’ Standards; from developing good relationships with children and other colleagues to promote learning, to working within a framework and national and school policies to deliver the Curriculum. Experience in school progresses from observing and working alongside the class teacher, to taking full responsibility, initially for individuals and groups, and later, for a whole class. Training sessions are delivered weekly (during the Autumn and Spring term) by a range of experienced teachers, outstanding practitioners and leading figures in their field. A block training week in November addresses the latest and most topical issue in today’s teaching, including systematic synthetic phonics, engagement and underachievement and behaviour management. All trainees on the 2Schools Consortium School Direct (Salaried) Programme will have the opportunity to work towards a PGCE (Primary Education) award which will be validated by the University of East London. 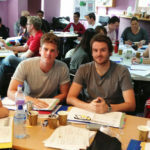 Assessment of the teaching is carried out regularly through observations of lessons throughout the placement. An essential part of the course is the tasks and assignments that trainees carry out to address a number of topics including amongst others, behaviour management, formative and summative assessment in the classroom and an SEN personalised task. Teaching is assessed against Qualified Teacher Status (QTS) Standards, teaching practices across two school placements. Observations and assessments are made by school-based mentors and link tutors. Subject knowledge, pedagogy and a trainee’s development as a reflective practitioner are assessed through a combination of observations, written assignments and evidence files. All trainees are expected to attend the training sessions and attempt to fulfil the expectations and requirements of the PGCE. In completing the programme, successful submission of the two level 7 modules will lead to the award of Postgraduate Certificate of Education, carrying 60 level 7 credits. If on resubmission either of the level 7 modules passes at level 6 only, the award is Professional Graduate Certificate of Education, carrying either 30 level 7 credits or no level 7 credits. A resubmission opportunity is provided if trainees are unsuccessful on the first submission of any of the assignments. Input and study includes equal opportunities; assessment; teaching art, music, P.E. religious education and ICT; job applications and interviews. Each term progress towards the standards required for Qualified Teacher Status is assessed and targets are set. NOTE: THE CONSORTIUM EXPECTS ALL ITS EMPLOYEES TO HAVE A FULL COMMITMENT TO THEIR LOCAL AUTHORITY’S EQUAL OPPORTUNITIES POLICY AND ACCEPTANCE OF PERSONAL RESPONSIBILITY FOR ITS PRACTICAL APPLICATION. ALL EMPLOYEES ARE REQUIRED TO COMPLY WITH AND PROMOTE THE POLICY AND TO ENSURE THAT DISCRIMINATION IS ELIMINATED IN THE SERVICE OF THE AUTHORITY. As a paid member of staff you have the same conditions of service as all other staff members, as follows. We expect you to be in school between 8.00 and 4.00. If you are ill or have other reasons for absence please ring your school office as early as possible (before 8.a.m.) on the first day, and keep us informed daily until you are able to return. After 3 days illness teachers need to self- certificate. Complete a ‘Training Absence Request Form’ (Doc 29) for absences from training sessions, must which should be emailed to the Programme Leader. Attend and contribute to year group planning meetings. Maintain confidentiality- it’s OK to talk about your work but don’t name the children or parents outside the school. Do playground duty once a week. Be sensitive to your mentor’s and other staff’s needs and the demands of their other responsibilities. Keep your mentor informed of your timetable so s/he knows when you are going to be out of class on training or observations, and also when you are going to be observed. You are entitled to PPA and an afternoon a week out of class which you need to use for self –directed learning (e.g. Completing tasks to be carried out of class; observing other CTs, planning/preparing for lessons, marking = anything with a learning outcome). To become familiar with pastoral school policies which affect the daily life of the school, eg behaviour, equal opportunities, racial equality, health and safety, child protection, and to act in accordance with the spirit of these in all dealings with the children. To work alongside the class teacher in all non-teaching aspects of their role, for example preparation of resources, photocopying, classroom maintenance, displays and playground duties. To observe and make notes on the way teachers plan for, teach and manage their classes. To work with groups of children as directed by the class teacher. To build up skills in whole class management, initially through taking the register, reading stories and managing whole class movement around the school to assembly, the playground etc, then through leading parts of lessons, whole lessons and parts of days as directed in training plan. By the end of term 2 to have increased whole class teaching to about 75%. Attendance at internal and external training (Training is compulsory and failure to attend must be addressed as per absence policy, see below. Non attendance must be authorised through completion of a ‘Training Absence Request Form’ -Doc 29. Persistent lateness to training will be addressed through our Cause for concern policy). Arranging to observe or meet subject/teaching specialists within this and other schools, and to keep notes for your portfolio of evidence. To develop and maintain your portfolio of evidence, and have it available when requested. To attend staff meetings and INSET relevant to your training. To become familiar with the long and medium term planning formats used in the school and use the recommended lesson plans. To show your plan to your class teacher in advance for them to approve or amend. To be responsible for the class for an increasing proportion of the day as directed in your training plan. To provide you with a comprehensive induction to the training course. To give you guaranteed non-contact time to further your professional development. To ensure you are observed weekly and are given clear, focused and fair feedback. To hold termly formal reviews. To give you the opportunity to observe good practice in both key stages, meet with subject specialists and attend training/INSET. To make available the materials and resources needed for your work. To follow statutory quality assurance procedures.